Be the first to share your favorite memory, photo or story of Delphia. This memorial page is dedicated for family, friends and future generations to celebrate the life of their loved one. 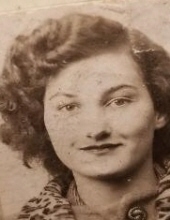 Delphia M. Elswick, 87 of Sissonville passed away peacefully on January 16, 2019, at The Cedar Ridge Center, after a long illness. She was a Homemaker, loving mother, grandmother, great grandmother, and was a member of Sunlight Baptist Church, Sissonville. Preceding her in death were her son, Timothy Mark Reed and her brother, Jack Shamblin. Survivors include her loving daughter, Ada Meacham Ramos of West Orange, NJ and Patricia Songer of Clearwater, FL; brothers, Arnie Shamblin of Cross lanes, WV and Ronnie Melton of Sissonville, WV. Also surviving are several grandchildren and great grandchildren who are also left to mourn her passing. In accordance with Delphia's wishes her body will be cremated with no visitation or services to be held. To send flowers or a remembrance gift to the family of Delphia M. Elswick, please visit our Tribute Store. "Email Address" would like to share the life celebration of Delphia M. Elswick. Click on the "link" to go to share a favorite memory or leave a condolence message for the family. Cunningham, Parker & Johnson Funeral Home | Mark D. Maltempie, L.I.C.